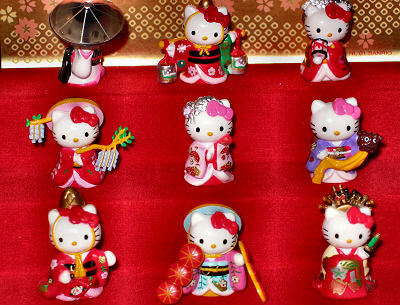 Andrea's Random Lil' Blog: My Kitty-chan's Kabuki Display! 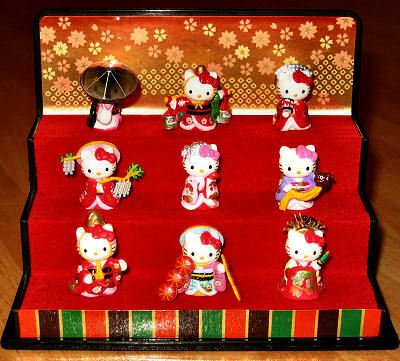 It is a lovely Kabuki display, containing Kitty-chan dressed up as 9 different characters of renowned Kabuki plays: Fuji Musume, Shizuka Gozen, the Hanagasa dancer from the Dohjohji play, Shiokumi etc... I still could not identify all of them, since I don't know much about Kabuki, unfortunately. I think I should perhaps buy a book about it next! What a lovely Kitty-chan Kabuki. Hi Andrea !!!! That´s such a wonderful display !!!! 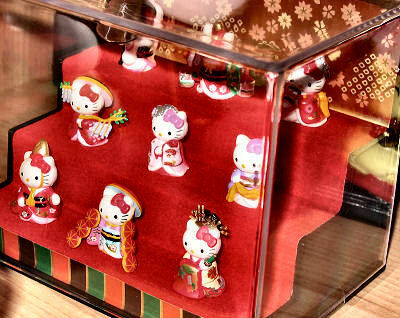 I´m fan of both Hello Kitty and Kabuki and I love that display. You asked about the doll with the umbrella: that´s Kitty-chan as the Heron Maiden ("Sagi Musume" in japanese)of the play with the same name. You can see a video on Youtube with the renowed onnagata (actor who plays female roles in kabuki) Bando Tamasaburo playing this role (the link: http://www.youtube.com/watch?v=4q1MPwD7zCI). Sagi Musume, que bom, agora já fico sabendo! Adorei a info! Vc é de Sampa? Eu acabo de chegar do Rio agora (2 dias atrás) e tenho uma grande amiga de Sampa que também vive aqui em Dublin! Muito legal mesmo. Mais uma vez, mil obrigadas e vamos ver se gente mantém contato, né? Nossa, vc acabou de chegar daqui do Brasil ent�o !!! Fui ao Rio de Janeiro no m�s passado, mas foi uma passada r�pida, um dia s�. Tenho um tio que mora l�. Vamos manter contato sim !!! Vc tem orkut ??? Se n�o tiver, me e-mail � betsy_hayashi@yahoo.com.br. Um grande beijo e �tima semana p/ vc tb !!! !